ATK Semi Automatic Horizontal Balers are manufactured using hardened wear plate to the bale chamber and main press ram, standard heavy-duty steel sections and the highest quality components. These machine are ideal for medium sized production of Plastics bottles, Cans, Paper, Card, Foam, Polythene etc. 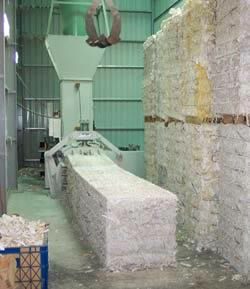 The balers are supplied with either 50, 60 or 70 tonnes of ram pressure, and are capable of producing bales up to 600kg. 8 sided individual shear blades fitted as standard. ATK offer a full range of fully automatic channel balers ranging from 1 tonne per hour up to 25-30 tonne per hour through puts. Each machine is fitted with a diagnostic monitoring and troubleshooting interface main control panel. The twister operation and travel is contained within a housing to ensure full protection against impact and contamination. Our trunnion - mounted cylinder is a special feature that sets ATK Balers apart from traditional balers. This feature greatly reduces stress on the Cylinder, Ram and the main structure of the Baler. The ATK Series Baler wire inserters have the ability to cope with very dense product due to our unique shear cutting design and hydraulic power ensures continuous operation. 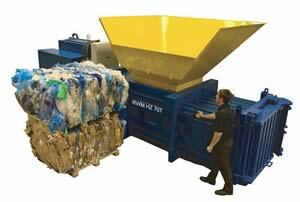 Each Baler is available as a stand alone unit with splayed hoppers to suit the customers bucket feed or designed to incorporate shredder/Baler combinations and Conveyor feeding through single or double ruffle systems for heavier more dense material. All machines are vigorously tested prior to delivery and come complete with CE marking and a declaration of conformity. View the information on the HZ 70T Horizontal Baler Press. For a FREE NO OBLIGATION WASTE AUDIT call our sales team NOW on 0845 6036764.